Looking for an affordable solution to keep your property secure under an always-on watchful eye, but don’t want to drill through walls for network and power cabling? One solution is an outdoor security camera with wireless capability and solar power. The Soliom S60 “Bird” offers both, but does it make a reliable security camera? To find out, we installed one! You’ll also find a manual to guide you through setting up the Soliom S60, as well as a Day and Night Warning sticker. In most territories, it is necessary to display a warning if you’re using any surveillance cameras on your property. As such, it is important to display the warning sticker where potential intruders can see it. The camera has a small input panel, hidden under a rubber cover. The reset switch and USB port can be found here. You’ll also find a microSD slot, compatible with cards up to 64GB. Note that the S60 does not ship with a microSD card, however, so you’ll need to provide your own. This will need formatting before inserting into the camera. The Soliom S60 is an IP (Internet Protocol) camera, with software and features added to make it suitable for security. IP cameras are network-connected devices. Some are capable of recording to a local SD card, while for others you’ll need a separate device elsewhere on the network to record data. 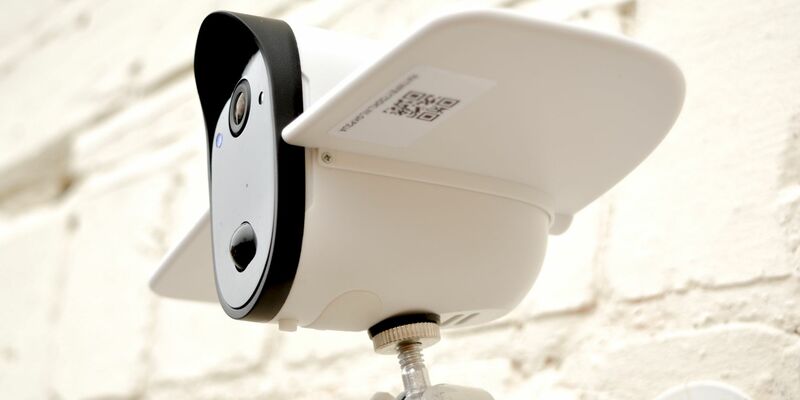 With an IP security cam, you can access a video feed of your property on any compatible mobile device, at any time. It’s a great way to ensure your home remains safe and secure. But it might not just be your home you’re interested in. Although marketed as a security cam, the Soliom S60 could be just as easily used as a baby monitor. You might even use it as a pet sitter. You’ve seen what’s in the box, but what does it all do when installed? The Soliom S60 is suitable for security and more indoors and outdoors. While traditional security cameras require on network and mains electric connections, the Soliom S60 is 100% wireless and charged using integrated solar panels, which keeps a reliable 4000mAh battery topped up. Security software features are included, which you can access once the device is paired with a mobile app (Android and iPhone/iPad). An accurate motion detector and alarm is included, with two-way motion detection technology (PIR and RADAR) to reduce false alerts. Trigger speed is 0.7 seconds, with detected motion resulting in a mobile notification. Footage of the event is also recorded onto the camera’s memory card. With 1080p full HD video at 15fps, the Soliom S60 has 33-49ft visible distance and a 130-degree viewing angle. An IR LED light enhances night vision, with a range of up to 32ft. Finally, the camera features two-way audio, enabling you to remotely hear and speak to anyone near the camera. It’s suitable for positioning inside and out, although positioning will depend on the size of your property. Before getting your hands dirty, the camera needs charging. The device ships with an 80% charge, so this will need topping up. Simply connect the included USB charge cable to the camera and a USB mains adapter. Recommended charge time for this is five hours. Next, get the Soliom S60 set up on your wireless network. It’s a smart idea to do this close to your router. This will ensure proper set up of the camera, using the mobile app. Soliom offers an app for Android (2.3 and above) and iOS (7.0 or later), and the set-up process is straightforward. Simply tap the button on the camera to make it discoverable. Once the green LED turns blue, use the mobile app to detect, then input your network credentials. The app transfers these to the camera, adding it to your home network. Setting up our test device was a little tricky, requiring a couple of attempts. This is due to the password field in the Soliom app not displaying any characters you’ve typed, not even briefly. Additionally, the app requires access to your device microphone, as well as your phone’s storage. Repeated requests were made from the app to enable notifications, as well as auto-launch, but not enough information is given on how to do this. Once this is overcome (we checked online for the steps for the appropriate Android version) and the camera is connected, the app will display the feed from your camera. Note that once set up, the app will provide a QR code for you to easily configure another device running the Soliom app. This is thankfully straightforward and comparatively painless. With a 130-degree viewing area, multiple the Soliom S60s can be used to provide complete coverage of your property. However, before mounting, it is important to take the time to plan the device’s positioning. The Soliom S60’s screw mount can be mounted on a wall using a standard drill and the supplied screws. Even the most inept DIYers should be able to handle this! Our test S60 was mounted in just five minutes. Once the mount is screwed into the wall with anchors securing it, the camera can be attached. We mounted our device at the recommended 8ft from the ground, enough to oversee almost everything in the garden. Note that you don’t have to mount the camera on a wall. A tripod is also available for the Soliom S60 “Bird”. This must be purchased separately, however. Alternatively, if you’re mounting indoors, the S60 can be positioned upright, perhaps on a shelf. With the camera mounted, it’s time to adjust its positioning. Getting this right means installing the app, establishing the feed, then tweaking the camera’s viewing angle. After setting up the camera, it’s a simple task to use the app to determine the correct viewing angle. Aim for the best coverage of your property, avoiding overlooking any neighboring land without prior agreement. The mounted camera can now be accessed from anywhere. As long as you have a phone with the app running, the feed can be viewed, and footage saved. Unfortunately, there is no option to view the camera feed in your browser. Even after checking the IP address of the Soliom S60, it wasn’t possible to access the feed other than via the app. While this isn’t a deal-breaker, it does restrict the possibilities of the camera somewhat. One problem experienced using the app beyond the home network was an inability to connect to the video feed over 4G. My home internet is fast, so this should not have been an issue. Your feed is stored free in the cloud, which means that any motion detection alerts can be viewed after the event. Alerts are also stored to the microSD card. Meanwhile, you can automatically record what’s going on over the cam by tapping the record button on the app. There’s also the option to take photos and use the microphone to communicate with whoever is near the camera. By default, the camera streams in standard definition. However, you can easily switch to HD for improved quality. Note that this will have greater data requirements, as well as require more storage on your microSD card. While the Soliom S60 can of course be used indoors, mounting a camera on an external wall demands some weatherproofing. This wireless solar camera is build to the IP66 weatherproof standard, capable of withstanding all but the most extreme weather conditions. Its high-quality plastic build is designed to protect the internals and lenses from extreme weather and impact. Meanwhile, the battery—charged even when the weather is not sunny—works at temperatures between -4 and +140 degrees Fahrenheit (that’s -20 to +60 degrees C). Thankfully we couldn’t test this out with any actual extreme weather, but the camera certainly survived a couple of drops. In terms of power consumption, the 4000mAh battery should be enough to last the day. Continuous daytime recording of 12 hours is available, with eight hours of night vision. It is unlikely that continuous recording for these durations will be required, however. The single key challenge for using the S60 is wireless connectivity. While residents of smaller properties might expect a connection to be maintained, this will largely depend on the range of the router and the design of the building. Wireless signals travel along a direct line from A to B. Obstacles can reduce signal strength considerably. Positioning the S60 too far from the router, or beyond line of sight, will result in a weaker signal. This can impact your access to the camera. As such, using a Soliom S60 camera may require you to set up a wireless repeater to ensure a reliable network connection. The camera includes a reset switch that can be used if you need to deal with any software issues. A pin is included to access this switch, found near the microSD card slot. Other problems can be experienced with 4G. Half the time, the app doesn’t respond to requests to display the camera feed, although notifications of motion in the surveyed area are reliable. Sensitivity and alert type can be tweaked in the app settings. You’ve probably noticed that there isn’t much sun indoors. So, how does the Soliom S60 “Bird” work as an internal security camera? Well, setup remains the same, but power will instead depend upon a regular USB connection to charge the battery. Usefully, the solar panel can be removed by removing a securing screw at either side of the camera. One benefit of this approach is that you’re likely to have a better network connection. Lightweight and compact, the S60 is easier to mount than it is to set up with a mobile app. That says as much about the pairing as it does the single mounting nut. While the S60 makes a good security camera, I’m not convinced it wouldn’t be easily removed from its mount. Although the app could be better, it does a good job providing access to the camera. The notifications need some work, too, to improve grammar, but otherwise they’re timely, proving the motion detection works well. Overall a good security camera for the price, but not without software issues that we would hope to be fixed soon.